My prep is much less fussy as well. The original dish requires exceptional knife skills to thinly slice the salmon. I sometimes find it hard to even get the skin off the fish without mangling it too much, so I like to use the technique of broiling the fish skin side down on a piece of un-greased foil. When the fish is done, you can slide a spatula between the skin and the flesh of the fish and it will come right off the skin. Hooray! I realize that sorrel and ramps are not the easiest ingredients to come by. Farmers markets are great places to find these ingredients, but you can also sometimes find them in the regular supermarket. Sorrel is often found in the fresh herb section. Ramps are more seasonal -usually found only in spring. If you can’t find ramps, you could substitute a shallot and some spinach or arugula, or a small leek. A delicious dish for spring that uses lemony sorrel and savory ramps to compliment fresh wild salmon. You can easily double or triple this recipe to serve more people. Season salmon liberally with fennel salt and pepper. Place salmon skin side down on a foil-lined baking sheet. Do not grease the foil. Cook salmon on the center rack for 8-12 minutes until fish flakes easily apart, but is still rare in the center. While the salmon is cooking, heat butter in a large sautee pan on medium heat. Add the white parts of the ramps and sautee for 2-3 minutes until softened. Season with salt and pepper and sorrel and the green parts of the ramps and sautee for another minute. Add cream or half and half and reduce heat to low. When salmon is cooked, remove from oven and use a spatula to separate the flesh of the salmon from the skin. 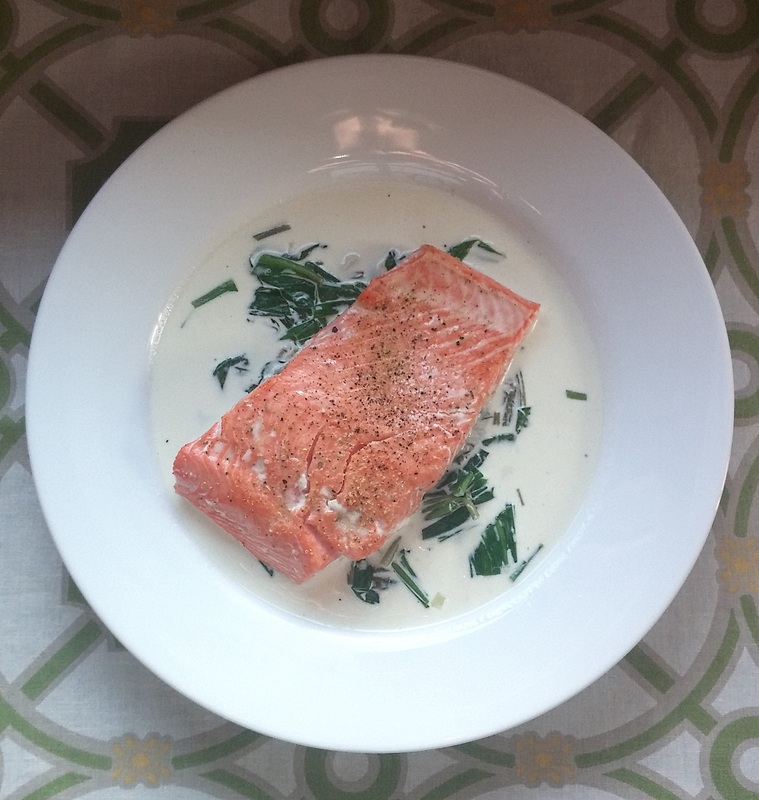 To serve, place 1/2 cup of cream sauce on plate and top with salmon fillet and drizzle with truffle oil. *I prefer Earth Balance vegan margarine. **If you can't get your hands on ramps, you could subsitute a shallot (finely minced) and 1 1/2 cups of spinach or arugula or a small leek, halved and thinly sliced.